Ingredients: Pasta: Durum Wheat Semolina, Water. Sauce: Milk, Water, Cream, Cheddar Cheese, Cornstarch, Flour, Butter, Flaxseed, Salt, Spices. Allergen and Intolerance information: Contains wheat, milk. May contain: Tree nuts, sulphites, sesame seeds, soy, egg. * Ancient Grain Bun included. Ingredients: Pasta: Durum Whole Wheat Semolina, Niacin, Folic Acid, Ferrous Sulphate, Riboflavin, Thiamine Mononitrate. Sauce: Tomatoes, Onions, Canola Oil, Flaxseed, Butter, Spices. Meatballs: Beef, Water, Chicken, Textured Soy Flour, Onions, Egg Whites, Italian Style Breadcrumbs (Wheat Flour), Flavouring, Romano Cheese, Salt, Hydrolyzed Soy Protein, Parsley. Allergen and Intolerance information: Contains wheat, milk, soy, egg. May contain: Tree nuts, sulphites, sesame seeds. Ingredients: Pasta: Durum Wheat Semolina, Water. Sauce: Tomatoes (Contains Calcium Chloride), Vegetables (Carrots, Broccoli, Cauliflower, Onions, Spinach), Water, Canola Oil, Flaxseed, Butter, Spices, dehydrated Garlic, Mozzarella. Ingredients: cheese tortellini [pasta (enriched durum semolina (semolina, niacin, ferrous sulphate, thiamine mononitrate, riboflavin, folic acid), fresh liquid whole eggs, water, salt), filling (cheese (ricotta cheese (pasteurized milk, modified milk ingredients, salt, lactic acid, potassium sorbate, sodium carbonate, sodium hydroxide), mozzarella, asiago, romano), breadcrumbs, canola oil, whey powder, salt, dehydrated garlic, spices], vegetable tomato sauce (tomatoes (contains calcium chloride), onions, water, spinach, carrots, cornstarch, canola oil, flaxseed, butter, spices, dehydrated garlic). Allergen and Intolerance information: Contains wheat, milk, and egg. May contain: Tree nuts, sulphites, sesame seeds, soy and/or mustard. Ingredients: Rotini (semolina, grain and legume flour blend [grains, and legumes (lentils, chickpeas, flaxseed, barley, spelt, oats), egg whites, oat fiber], durum flour, niacin, iron (ferrous sulfate), thiamine mononitrate, riboflavin, folic acid), vegetable tomato sauce (tomatoes (contains calcium chloride), onions, water, spinach, carrots, cornstarch, canola oil, flaxseed, butter, spices, dehydrated garlic). Parmesan cheese (milk, bacterial culture, salt, lipase, microbial enzymes, calcium chloride). Allergen and Intolerance information: Contains Gluten (wheat, oats, barley, spelt), milk, and egg. Ingredients: Enriched flour, water, barley flakes, sunflower seeds, whole grain kamut flakes, whole grain spelt flakes, flax seeds, wheat flour, wheat bran, sugar, oats, flakes, quinoa seeds, salt, millet seeds, dried sourdough of rye (rye flour, yeast, and bacterial culture), wheat gluten, malted barley flour, vegetable oil (canola and/or soya), yeast, wheat bran, dough softener (water and monoglycerides with propionic and phosphoric acid), sodium stearoyl lactylate (SSL). Allergen and Intolerance information: Contains wheat, kamut, barley, rye, spelt and oats. May contain: Tree nuts, sesame seeds, milk, egg, soy, seafood, mustard, and/or sulphites. Ingredients: Cooked basmati rice (basmati rice, water, salt), chicken breast, carrots, sesame oil, red onions, celery, peas, low sodium soy sauce, hoisin sauce (sugar, water, soybeans, salt, sweet potato, modified corn starch, sesame seeds, garlic, wheat flour, chili peppers, spices, caramel colour, acetic acid, coloring, potassium sorbate). Allergen and Intolerance information: Contains Wheat,sesame seed, and soy. May contain: Tree nuts, milk, egg, seafood, mustard, and/or sulphites. Ingredients: Cooked basmati rice (basmati rice, water, salt), white onion, canola oil, carrots, celery, corn kernels, peas, cumin, and tumeric. Allergen and intolerance information: Contain none. May contain: Tree nuts, sesame seeds, milk, egg, soy, seafood, sulphites, and/or mustard. Ingredients: Basmati rice, broccoli, chicken breast [chicken, water, canola oil, soy protein isolate, salt, flavour (modified corn starch), potassium chloride, sodium phosphate, corn maltodextrin, spices, carrageenan], onions, canola oil, soy sauce (water, wheat, soybeans, salt, sodium benzoate), lemon juice, garlic, ginger, sugar, cilantro, salt, black peppers. May contain: Tree nuts, milk, mustard, sulphites, sesame seeds, and/or egg. Ingredients: Tomato tortilla, chicken breast, romaine lettuce, Caesar dressing (water, maltodextrin, soybean oil, vinegar, salt, sugar, parmesan cheese, modified corn starch, liquid whole egg, liquid yolk, autolyzed yeast extract, dehydrated garlic, spices, potassium sorbate, anchovy paste (anchovies, water, soy flour, salt), xanthan gum, fumaric acid, phosphoric acide, artificial colour, flavour, propylene glycol, alginate, calcium disodium EDTA), parmesan cheese, cream cheese. Ingredients: Tomato tortilla, smoked turkey, romaine lettuce, red peppers, Italian dressing (water, vinegar, salt, sugar, soybean oil, garlic, garlic, xantham gum, potassium sorbate, herbs and spices, onions, red bell peppers, calcium disodium EDTA, colour (tartazine)), light cream cheese. Ingredients: Tomato tortilla, homous (chickpeas, sesame seed pulp, chic pea flour, water, lemon juice, vegetable oil, vinegar garlic, parsley, salt, spices, caraggenan, potassium sorbate), romaine lettuce, carrots, cucumber, red pepper, and celery. Allergen and Intolerance information: Contains wheat. May contain: Tree nuts, sulphites, mustard, sesame seeds, egg and/or soy. Ingredients: Veggie mix (Refried beans, celery diced, chick peas, white onions, diced carrots, mushrooms, red pepper, veggie oil, salt, garlic, chili powder, pepper), tomato tortilla, rice mixture (rice, salsa, mozzarella cheese, sour cream, green onion, cilantro), chicken breast, cheddar cheese, cream cheese. 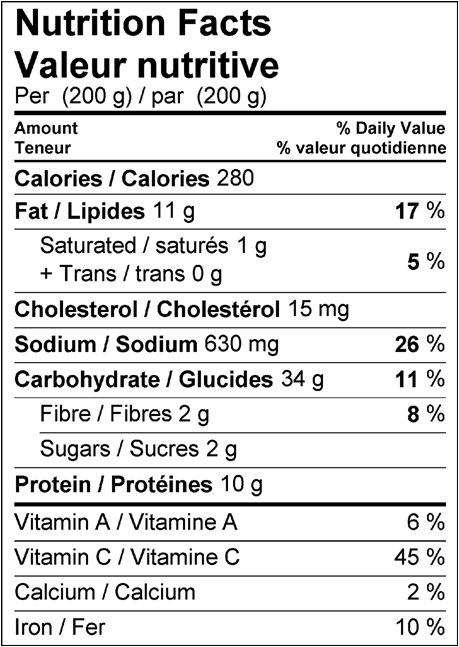 May contain: Tree nuts, sulphites, mustard, sesame seeds, egg, soy and/or seafood. Ingredients: Salad mix, chicken breast, caesar dressing (water, soybean oil, parmesan and romano cheese, egg yolk, vinegar, salt, sugar, modified cornstarch, garlic, spices and seasonings (contains wheat and soybean), anchovy paste, lactic acid, lemon juice concentrate, hydrolyzed soy protein, dried onion, sorbic acid, xanthan gum, polysorbate 60, dried garlic, calcium disodium EDTA), parmesan cheese (milk, bacterial culture, salt, lipase, microbial enzymes, calcium chloride). Allergen and Intolerance Information: Contains wheat, milk, egg, soy and fish. May contain: Tree nuts, sesame seeds, sulphites. 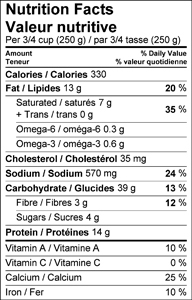 Ingredients: Sushi rice [Rice (water, potato starch, enzymes (papain, protease, alpha-amirlase), vinegar mixture (sugar, salt, distilled vinegar (contains salt)], artificial crab [Fish protein (pollock, pacific whiting and/or cod), water, potato starch, sugar, egg white, wheat starch, soybean oil, salt, sugar, sorbitol, contain 2% or less of: salt, wheat flour, modified tapioca starch, natural and artificial crab flavour], rice wine, wheat gluten, calcium carbonate, celullose, carrageenan, hydrolyzed corn protein, sodium tripolyphosphate, tetrasodium pyrophosphate, autolyzed yeast extract, color, contains fish, shellfish, egg, wheat, soy and milk, cucumber, salad dressing (water, soybean oil, vinegar, glucose – fructose, sugar, modified corn starch, egg yolk, salt, mustard, spices, colour, potassium sorbate, calcium disodium EDTA, dried garlic), seaweed, sesame seeds, distilled vinegar (contains salt), sugar, salt. Allergen and Intolerance information: Contains wheat, sesame seeds, egg, soy, milk, and seafood. May contain: Tree nuts, and/or sulphites. Ingredients: Sushi rice [Rice (water, potato starch, enzymes (papain, protease, alpha-amirlase), vinegar mixture (sugar, salt, distilled vinegar (contains salt)], teriyaki chicken breast [chicken breast, teriyaki sauce (naturally brewed soy sauce (water, wheat, soybeans, salt), sugar, water, modified food starch, vinegar, onion juice, natural flavor, garlic powder, fumaric acid, dehydrated yeast, fermented wheat protein, sodium benzoate, spice)], cucumber sticks, romaine lettuce, sesame seeds. Allergen and Intolerance information: Contains wheat, sesame seeds, and soy. 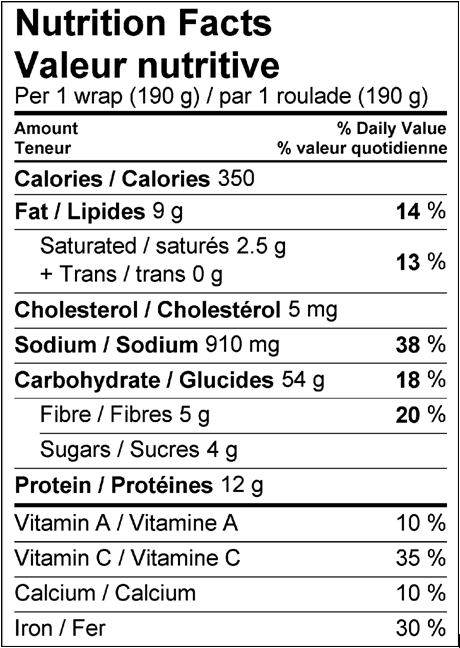 Ingredients: Sushi rice [Rice (water, potato starch, enzymes (papain, protease, alpha-amirlase), vinegar mixture (sugar, salt, distilled vinegar (contains salt)], cucumber, tofu, carrot, yellow pepper, red pepper, romaine lettuce, Japanese mayo [salad dressing (water, soybean oil, vinegar, glucose – fructose, sugar, modified corn starch, egg yolk, salt, mustard, spices, colour, potassium sorbate, calcium disodium EDTA, dried garlic), picked ginger, wasabi powder], nori, sesame seeds, and parsley. Allergen and Intolerance information: Contains sesame seeds, soy, and egg. May contain: Tree nuts, wheat, milk, seafood, mustard, and/or sulphites. Ingredients: Beef sausage (beef, water, modified corn starch, modified milk ingredients, salt, potassium lactate, mustard, sugar, sodium erythorbate, sodium diacetate, spice, sodium nitrite, flavour (garlic), smoke), hot dog bun (whole grain whole wheat flour, water, sugar/glucose-fructose, soybean and/or canola oil, yeast, wheat gluten, salt, vegetable monoglycerides, calcium propionate, sodium stearoyl-2-lactylate, diacetyl tartaric acid esters of mono and diglycerides, sorbic acid). 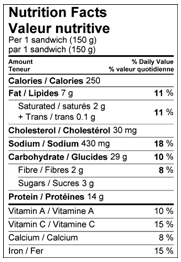 Allergen and Intolerance information: Contains gluten (wheat), milk, soy, and mustard. May contain: Tree nuts, sesame seeds, egg, seafood, sulphites. Ingredients: Veggie dog (water, soy protein, wheat gluten, dextrose, canola oil, spices, natural flavour, wheat starch, hydrolyzed corn and soy protein, salt, natural liquid smoke, yeast extract, carrageenan, guar gum, vitamins and minerals (thiamine hydrochloride, riboflavin, niacinamide, pyridoxine hydrochloride, cyanocobalamin, calcium pantothenate, reduced iron, iron oxide, zinc oxide, dipotassium phosphate, wheat starch). Cracked wheat bun (wheat flour and bran, azodicarbonamide, ascorbic acid, water, unbleached flour, cracked wheat, canola oil, yeast, sugar, yeast, molasses, dough conditioner (wheat flour, diacetyl tartaric acid, esters of mono diglycerides, dextrose, canola oil, ascorbic acid, azodicarbonamide, L-cystine, hydrochloride, enzymes), calcium propionate. Allergen and intolerance information: Contains wheat, soy. May contain: Tree nuts, sesame seeds, milk, egg, seafood, sulphite, and/or mustard. Ingredients: Beef burgers – (beef, wate,r textured vegetables proteins (soya flour, caramel, zinc oxide, niacinamide, ferrous sulfate, copper gluconate, vitamin A Palmitate, calcium pantothenate, thiamine mononitrate (B1), pyridoxine hydrochloride (B6), riboflavin (b1), cyanocobalamine (b12), soya protein concentrate, salt, seasoning, hydrolyzed soy protein, dextrose, flavour, modified corn starch, corn syrup solids.) Bun – (unbleached enriched wheat flour, water, glucose-fructose, yeast, canola and/or soy oil, vital wheat gluten, salt, ammonium sulphate, dough conditioners [mono and diglycerides, sodium stearoyl-2-lactylate, ascorbic acid, azodicarbonamide, monocalcium phosphate], calcium sulphate, amylases, calcium propionate). May contain: Tree nuts, sesame seeds, milk, egg, seafood, sulphites. Ingredients: Shell (Enriched flour, water, canola oil, yeast, sugar, salt, seasoning, spices), sauce, (tomatoes, olive oil, sunflower oil, salt, oregano, seasonings, garlic, citric acid), mozzarella (partly skimmed pasteurized milk, modified milk ingredients, bacterial culture, salt, calcium chloride, microbial enzyme), pepperoni, Monterey Jack, parmesan cheese. Allergen and Intolerance information: Contains gluten (wheat), milk. May contain: Tree nuts, sesame seeds, egg, soy, seafood, sulphites. 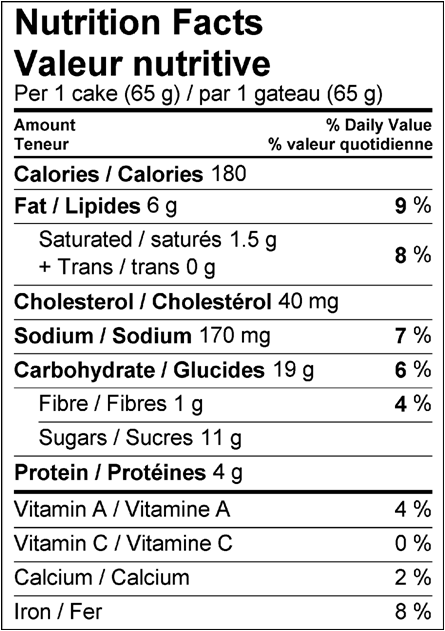 Ingredients: Shell (enriched flour, water, canola oil. Yeast, sugar, salt, seasoning, spices), sauce (tomatoes, olive oil, sunflower oil, salt, oregano, seasonings, garlic, citric acid), mozzarella (partly skimmed pasteurized milk, modified milk ingredients, bacterial culture, salt, calcium chloride, microbial enzyme), Monterey jack cheese, parmesan cheese. Allergen and intolerance information: Contains gluten (wheat), and milk. Ingredients: Shell: (enriched flour, water, canola oil, yeast, sugar, salt, seasoning, spices), sauce (tomatoes, olive oil, sunflower oil, salt, oregano, seasonings, garlic, citric acid), mozzarella (partly skimmed pasteurized milk, modifiered milk Ingredients: , bacterial culture, salt, calcium chloride,microbial enzyme), pineapple, smoked ham, Monterey Jack, parmesan cheese. Ingredients: Chicken breast fillets, water, corn flour, whole wheat flour, whole grain rolled oats, wheat flour, wheat bran, corn starch, sea salt, egg whites, garlic, cream of tartar, spices, and canola oil. Allergen and Intolerance information: Contains wheat, and egg. 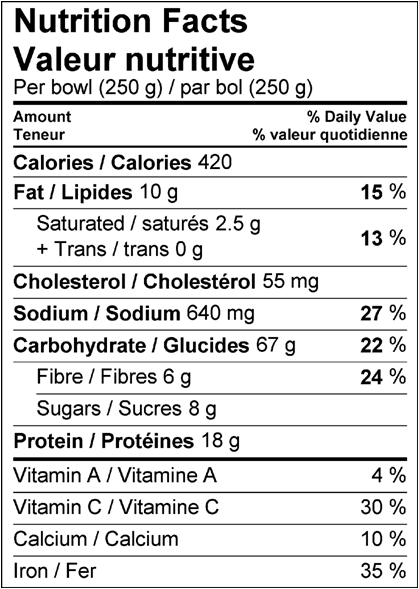 May contain: Tree nuts, sesame seeds, milk, soy, seafood, mustard, and/or sulphites. Ingredients: Soup: Pasta (durum wheat semolina, water, egg whites), corn syrup solids, dehydrated vegetables (carrots, onions, celery), modified corn starch, chicken fat, dehydrated white chicken meat, sea salt, onion powder, autolyzed yeast extract, salt, corn maltodextrin, flavour, modified cellulose, dehydrated chicken broth & powder, disodium guanylate, disodium inosinate, beef or pork gelatin, dehydrated parsley, silicon dioxide, spice, calcium phosphate, wheat flour, whey powder, soy lecithin, and sulphites). Cracked Wheat Bun: (water, wheat flour, and bran, azodicarbonamide, ascorbic acid, unbleached flour, sugar, wheat flour, salt, dextrose, sodium stearoyl-2-lactylate, vegetable (canola and/or soya) oil, enzymes, ascorbic acid, L-cysteine hydrochloride, cracked wheat, yeast, oil (canola), calcium proprionate). 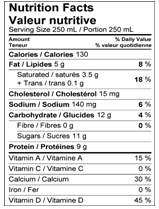 Allergen and Intolerance information: Contains gluten (wheat) egg, milk, soy, sulphites. May contain: Tree nuts, sesame seeds, and/or mustard. Ingredients: Tomatoes, kidney beans, water, ground beef, white onions, tomato paste (diced tomatoes, tomato puree, carrot puree, sugar, extra virgin olive oil, onions, salt, soy oil, garlic and spices), celery, green pepper, carrots, brown sugar, corn starch, chili powder, garlic, salt, black pepper. Allergen and Intolerance information: Contains soy. May contain: Tree nuts, wheat, milk, sulphites, egg, soy, sesame seeds. Ingredients: Salad mix, caesar dressing (water, soybean oil, parmesan and romano cheese, egg yolk, vinegar, salt, sugar, modified cornstarch, garlic, spices and seasonings (contains wheat and soybean), anchovy paste, lactic acid, lemon juice concentrate, hydrolyzed soy protein, dried onion, sorbic acid, xanthan gum, polysorbate 60, dried garlic, calcium disodium EDTA), parmesan cheese (milk, bacterial culture, salt, lipase, microbial enzymes, calcium chloride). Ingredients: Carrots and fat free ranch dressing (water, corn syrup, modified milk ingredients, vinegar, sugar, modified corn starch, salt, natural flavour, colour, spices, phosphoric acid, potassium sorbate, sodium benzoate, onion powder, garlic powder, xanthan gum, disodium guanylate, disodium inosinate. Allergen and Intolerance information: Contains milk. May contain: wheat, tree nuts, sesame seeds, egg, soy, seafood, sulphites.mustard. Ingredients: Red peppers, and fat free ranch dressing (water, corn syrup, modified milk ingredients, vinegar, sugar, modified corn starch, salt, natural flavour, colour, spices, phosphoric acid, potassium sorbate, sodium benzoate, onion powder, garlic powder, xanthan gum, disodium guanylate, disodium inosinate. May contain: wheat, tree nuts, sesame seeds, egg, soy, seafood, sulphites. Ingredients: Apples: Apples, Ascorbic Acid (Vitamin C), Calcium; Grapes. Allergen and Intolerance information: Contains None. 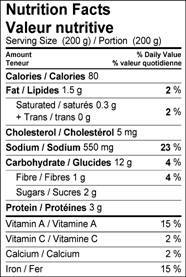 May contain: Wheat, tree nuts, sesame seeds, milk, egg, soy, seafood, sulphites. Ingredients: Frozen apples and blueberries, water, sugar, flour, rolled oats, yellow sugar, palm and canola oil vegetable shortening, cinnamon, modified cornstarch, canola oil and palm oil margarine, salt. Allergen and Intolerance information: Contains wheat, soy, milk. May contain: Tree nuts, sulphites, eggs, sesame seeds. Ingredients: Apple sauce (apple, water, and ascorbic acid), liquid whole egg, sugar, flour, cocoa, chocolate chip (sugar, chocolate liquor, cocoa butter, soya lecithin), canola oil, vanilla, baking powder, and salt. Allergen and Intolerance information: Contains Wheat, egg, soy, and sulphites. May contain: Tree nuts, sesame seeds, milk, and seafood, sulphites. Ingredients: Cake flour, butter milk, white sugar, liquid whole eggs, wheat flour, apple sauce, canola oil, palm and canola oil margarine, lemon emulsion, lemon zest (lemon peel, sugar, lemon oil), natural vanilla extract, modified tapioca starch, baking powder, sodium bicarbonate, and salt. Allergen and Intolerance information: Contains gluten (wheat), milk, egg, and soy. May contain: Tree nuts, sesame seeds, and/or sulphites. Ingredients: Palm and canola oil margarine, yellow sugar, whole wheat flour, wheat flour, chocolate chip (sugar, chocolate liquor, anhydrous dextrose, cocoa butter, soya lecithin), white sugar, egg, molasses, natural vanilla flavour, sodium bicarbonate, and salt. Allergen and Intolerance information: Contains wheat, soy, and eggs. May contain: Tree nuts, sesame seeds, milk, and/or sulphites. Ingredients: Palm and canola oil margarine, oats, yellow sugar, chocolate chip (sugar, chocolate liquor, anhydrous dextrose, cocoa butter, soya lecithin), whole wheat flour, wheat flour, egg, molasses, natural vanilla flavour, baking powder, sodium bicarbonate, and salt. 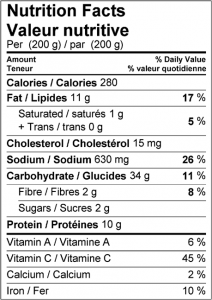 Allergen and Intolerance information: Contains wheat, egg, soy, and oats. Ingredients: donut bite ( Wheat flour, buttermilk, white sugar, canola oil, egg, baking powder, natural vanilla, cinnamon, nutmeg, and salt), sugar mix (icing sugar, sugar, and cinnamon). May contain: Tree nuts, sesame seeds, soy, and/or sulphites. Ingredients: Apples and grapes [Apples (apples, Ascorbic Acid (Vitamin C), Calcium), grapes], ancient grain bun [Enriched flour, water, barley flakes, sunflower seeds, whole grain kamut flakes, whole grain spelt flakes, flax seeds, wheat flour, wheat bran, sugar, oats, flakes, quinoa seeds, salt, millet seeds, dried sourdough of rye (rye flour, yeast, and bacterial culture), wheat gluten, malted barley flour, vegetable oil (canola and/or soya), yeast, wheat bran, dough softener (water and monoglycerides with propionic and phosphoric acid), sodium stearoyl lactylate (SSL)], marble cheddar cheese(milk, modified milk ingredients, bacterial culture, salt, microbial enzyme, colour), mozzarella cheese (partly skimmed milk, modified milk ingredients, bacterial culture, salt, microbial enzyme, calcium chloride). Allergen and Intolerance information: Contains : wheat, kamut, barley, rye, spelt, oats, soy, and milk. 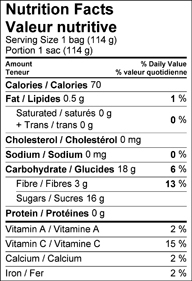 May contain: Tree nuts, sesame seeds, egg, seafood, mustard, and/or sulphites. Ingredients: Partly skimmed milk, vitamin A, palmitate, vitamin D3. Allergen and Intolerance information: Contains : milk. Ingredients: Partly skimmed milk, sugar, cocoa, corn starch, colour, salt, carrageenan, artificial flavour, vitamin A Palmitate, vitamin D3.. Ingredients: Water, concentrated apple juice, vitamin C.
Allergen and Intolerance information: Contains : none.